This is what I was doing last Friday. 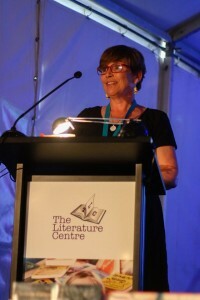 I missed Poetry Friday last week because I was off having an amazing time at the Celebrate Reading Conference in Fremantle (did I say amazing? I mean really really stupendously amazing!). It’s not the first time I’ve missed Poetry Friday since I started doing it earlier this year, and it probably won’t be the last, and there are some weeks where Friday comes and I think “oops” and I rush to get something suitable posted. This week I got to Thursday afternoon before I thought ‘now what am I going to write about this week?’ And, because I was about to rush out the door to do the school pick up, I wondered if maybe I’d give it a miss again this week. I love poetry. And Fridays. And Poetry Friday celebrates both of those things. I love discovering new poems, poets, collections, verse novels, poetic forms. There is always something new to discover. I love the way Poetry Friday puts so much focus on (of course) poetry, which often struggles for air time. I love that I am connecting with poets and poetry lovers from around the world on a weekly basis and, as a result learning not just about poetry but about stuff happening in far flung places. So much love! Which made me think I should finish off with a poem. It’s more than a wee bit corny, but here’s my love poem for Poetry Friday, with apologies to Elizabeth Barrett Browning. For the joy you give, the peace and grace. In my old joys, and with my childhood’s faith. I shall but love as long as I shall live. Okay, it’s a bit OTT, but I do really like Poetry Friday, which this week is being hosted by Write. Sketch. Repeat. Pop over there if you have some time and click though to some of the other wonderful poetry posts. Hi, Sally. While all of your reasons are wonderful, #5 is my favorite. I’ve met so many wonderful people through Poetry Friday. It’s great to share our mutual love of poetry, language, books, and poetry education. Thanks Laura. It’s wonderful, isn’t it? This should have been the FIRST post in the PF roundup this week! So much PF love here! It’s the best, isn’t it? Love that you’ve joined us this year!! Aww. Thanks Mary. I’m having lots of fun and learning heaps too.